This antique Singer sewing machine is located in the upholstery shop at the old 18th Street bus maintenance facility in Norfolk Virginia. HRT moved out this past weekend and the buildings will be torn down next month. The building containing the upholstery shop was once the transit company's blacksmith shop and dates to the early 1900's. The site has continually served public transit since the late 1800's, first with electric trolleys and for the past 60 years as a bus operations facility. A new bus operations facility will be constructed on the site. Canon 40D, 1/60 sec at f/5.6, ISO 400 converted to black and white using Silver Efex Pro in Photoshop Elements 6. I realize it is not a historic house, site of famous battle or anything like that - but here is yet another piece of Norfolk history about to meet progress. I hope at least someone will take the sewing maching home. 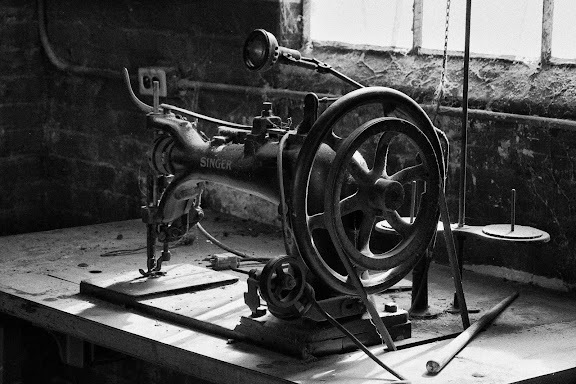 I concur with Les, I hope at least the sewing machine will find a place of honor somewhere....... A shame that each little piece of history is leveled. This photo has a beautiful yet scary feel to it. You can’t stop looking at it. Thanks everyone for the comments. We plan to save the old sewing machine and other artifacts to be displayed in the new building.